If you're a regular reader of the 13th Floor, you probably have an affinity for states and localities. And there's probably a good chance you have a soft spot in your heart for maps. If so, you've got to check out The Atlas of Strange Maps, a blog collecting and showcasing weird, offbeat maps of the U.S. and the world. Some of these maps are great! It's hard to even pick a favorite. There's the one showing the leading church body in each county of the U.S. -- making it stunningly clear how interwoven religion is with regionalism. I love the one that plots different regions of South Carolina based on the main condiment used in BBQ sauce -- tomatoes, ketchup, mustard or vinegar and pepper. There are two fantastic maps based on music -- one showing each state in proportional size based on how often it gets mentioned in country music songs, and another mapping out the area codes mentioned in the rap song "Area Codes," by Ludacris. 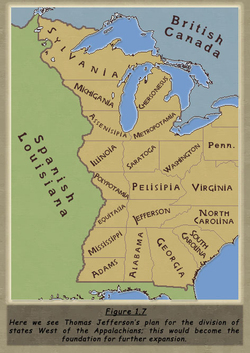 But the best one just might be this map that plots the way Thomas Jefferson, in 1784, proposed splitting up the nation west of the Appalachians. His vision included regimented states with right-angle borders -- and names so silly they ultimately doomed the whole plan. Cheronesus? Assenisippis? Metropotamia? Polypotamia? Pelipsia? Who wants to be from there?